Michael Emerson in Wakey, Wakey. Photo by Joan Marcus. BOTTOM LINE: Will Eno's latest endeavor fiddles with the concept of time, memories, and other big issues, while offering an experience that is intimate, moving, and surprisingly entertaining. It's difficult, if not utterly impossible (and honestly unnecessary) to sum up what Wakey, Wakey is about. Will Eno’s latest work revisits his defining style from previous works Thom Pain and Title and Deed: it makes no attempt at a climactic plot or an epic romance, but rather "nudges" (there’s a key word from the play!) the audience's consciousness, and lingers like an echo. The play is not to be simply observed or received, but experienced and felt, for it evokes more than it demonstrates. From the very beginning, any attempt to understand the play, or to put it into a certain category, would prove futile. The first image sets the audience's heads spinning: a flash of light fills the space and a man lying face-down in pajama pants lifts up his head, as if awakening from a dream. "Is it now?" he asks. "I thought I had more time." And before another thought can be formed, everything goes dark once more. One gradually realizes that the presentation Emerson’s character makes is for his own wake, and that he’s a patient in the previously mentioned hospital. This process of revelation is like the endless depth of a Fibonacci spiral, or peeling off an onion with layer upon layers of secrets—an act that by its nature is ridiculous yet fascinating, and often ends with tears, which is exactly the case with Wakey, Wakey. Emerson’s portrayal of the dying man has a weighted serenity. 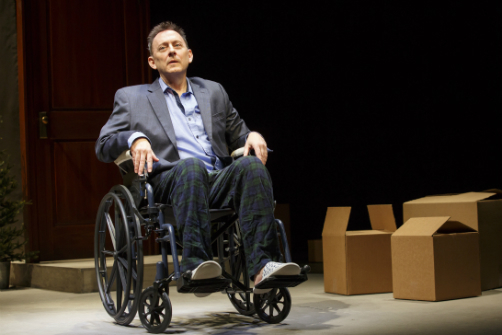 The Emmy-winning actor commands the stage with phenomenal subtlety: over the course of just over an hour, his fear grows and his vulnerability becomes increasingly visible. His presentation is briefly interrupted with the arrival of Lisa (January Lavoy), whose relation to him is never specified. The guy doesn’t recognize Lisa, but it is apparent that Lisa has been a recurring presence. Death is imminent in this oddly funny play. The protagonist describes it as a "highly expected event," comparing it to the scheduled arrival of a train, to which one would still have a surprisingly wide range of reactions. It is simultaneously heartwarming and heartbreaking as the pleasant party host's final moment comes. The nameless dying man's presentation, delivered with difficulty and sincerity, is indeed a way to prepare us for the impending loss. It's safe to say that everything is indeed connected in Eno's enigmatic play: each cryptic motif or seemingly nonsensical sound or image triggers something in the depth of your consciousness and ultimately compounds into something powerful, albeit indescribable. It’s also safe to assume every audio and visual element in the play is metaphorical. The set designed by Tony Award-winner Christine Jones hides much magic underneath the ostensibly realistic surface: the subdued hospital room is filled with packing boxes as if its occupant is getting ready for a big trip; and as the protagonist’s ultimate trip commences, the white walls become the backdrop of what seems to be memories of an entire world. David Lander and Nevin Steinberg, respectively, manipulate the lighting and sound of the production from a subliminal level to eventual grandeur. Eno's direction of his own script is tender, precise, and robust at all the right moments, making this world premiere perfectly cohesive. It plays tricks with the concept of time, making it beautifully unclear whether the whole play happens a moment before the protagonist's death as his life flashes before his eyes, or if it’s an actual program, prepared by the earnest patient in his final days. The play also effortlessly draws the audience into its world, as well as making our collective memories part of the narrative. It might be a challenge for some to fully embrace Wakey, Wakey, which doesn’t pretend to be anything other than its unique self, or shy away from addressing its own absurdity. It has the potential to be the most moving experience one could have in a theatre. And ultimately, it’s a play that ends with, instead of a resolution, a new beginning, an awakening, an invitation to form connections and start conversations with strangers; it serves as a reminder to collect the treasures of the preciously mundane, and whispers a hope that the audiences might leave the theatre feeling a little bit changed, and a lot more loved. Wakey, Wakey is written and directed by Will Eno. Scenic Design is by Christine Jones. Costume Design is by Michael Krass. Lighting Design is by David Lander. Sound Design is by Nevin Steinberg. Projection Design is by Peter Nigrini. Production Stage Manager is David H. Lurie. Assistant Director is Caitlin Ryan O’Connell. The cast is Michael Emerson and January Lavoy.